Spiros Law Partners with Adopt-A-Highway to Keep Our Community Clean | Spiros Law, P.C. At Spiros Law, we work hard every day in order to help people out in their time of need. We care about the communities we live in, and we want to take part in improving them, which is why we have partnered up with Adopt-A-Highway! The Illinois Adopt-A-Highway program allows volunteers to partner with IDOT to pick up litter and trash on the side of the highway. We are responsible for two different two-mile sections of highways in Champaign and Danville, and as a group, we pick up trash and litter dispersed across our designated routes. There are more than 10,000 Adopt-A-Highway volunteers throughout Illinois, and we are proud to be adding to this number. Because of Adopt-A-Highway volunteer’s efforts, roadways are safer, visitors and tourists have a better first impression of our state, and we get to enjoy a clean community. Littering is a serious issue that not only affects our community but also our environment as a whole. It is not an issue that we should not ignore. Littering has many negative effects, here are a few examples. When you litter on a highway, all of the cars following you are affected. For instance, a piece of litter could land on a windshield and block a driver’s vision, it could cause a driver to swerve, or it could lead to a driver having a flat tire. All of which are possible hazards on the road. Litter is damaging to our environment. When you litter non-biodegradable products, they stay there indefinitely. Litter degrades natural areas, harms the growth of plants, and it pollutes the air we all breathe. When communities have high amounts of litter, it results in lower home and property values in the area. When litter sits on the ground, waste seeps into the soil and pollutes the water underneath. The team at Spiros Law is extremely excited to be representing this program, allowing us to make a positive impact on not only our local communities but our environment. 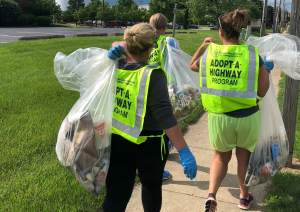 If you want to make a difference in your own community and want to register a group for the program, visit the IDOT website to fill out an Adopt-A-Highway request form.